Today Waiuta is a remote West Coast ghost town, at the end of a winding road up the Blackwater River, south of Reefton. 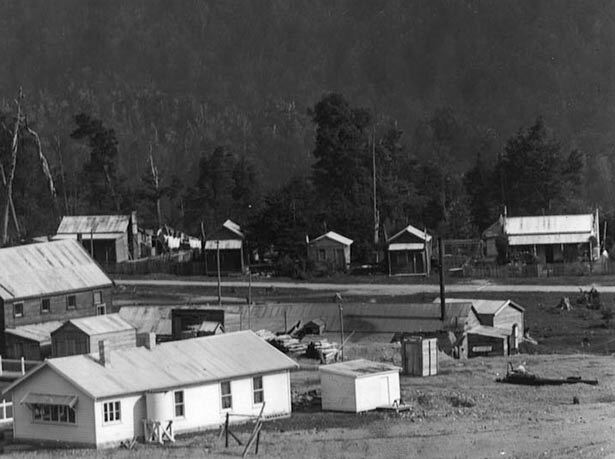 But from 1906 to 1951 it was the company town for the South Island's largest gold mine, exploiting one of the most regular and persistent gold reefs found anywhere in the world. More than 600 people lived there in its heyday, when the town had its own pub, shops, community facilities and sports clubs. One of the locals was Joseph Divis (1885-1967), who was born near Prague (now in the Czech Republic) and migrated to New Zealand in 1909. He worked as a miner, and spent much of his adult life at Waiuta. An experienced photographer, Divis used a shutter time-release and often darted out from behind the camera to appear in his own shots. Photographs taken in the mine show him wearing working clothes, but above ground he was almost always dressed in a distinctive safari suit. His carefully composed glass negatives provide a fascinating record of the mine, the town and its people in the 1920s and 1930s.